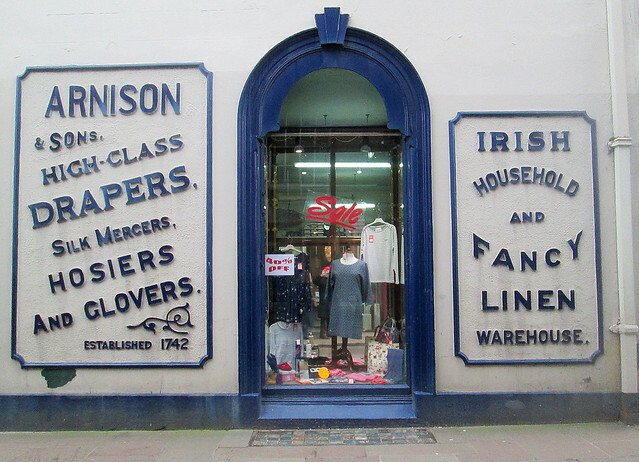 Last month we made a quick visit to Penrith in Cumbria, the North of England. We were on our way to Oswestry. Despite the fact that we’ve spent years going up and down between Scotland and England for some reason we had never got around to stopping off at this popular market town which is situated close to the Lake District. Actually we ticked two destinations off that day because we also visited Tebay services, a place that I had heard people raving about as the best motorway services in the UK – and they could be right. I was tempted by quite a few things but ended up just buying some lovely things to eat. I’m so glad that the owners of this shop haven’t felt the need to modernise. 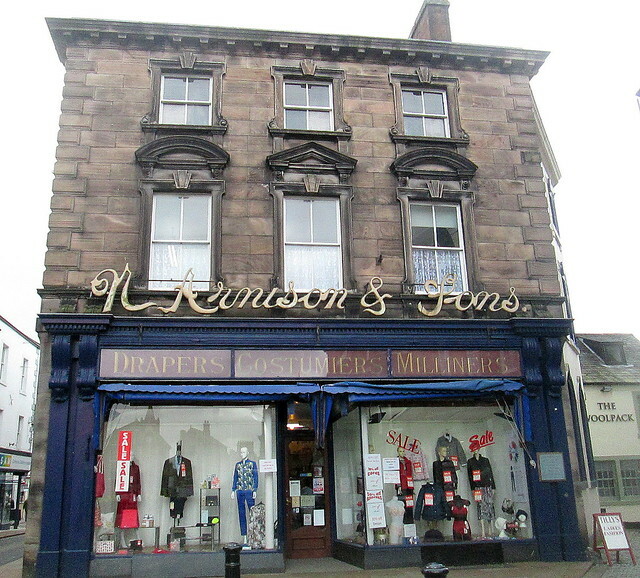 Drapers, Costumiers and Milliners. Perfect. Anyway – Penrith is an old-fashioned place, we only gave ourselves an hour to see the sights which wasn’t really long enough, especially as we found a good secondhand bookshop there. We only found the bookshop because we were looking at the old church which is close to the centre of the town. You can see lots of images of St Andrew’s Church here. 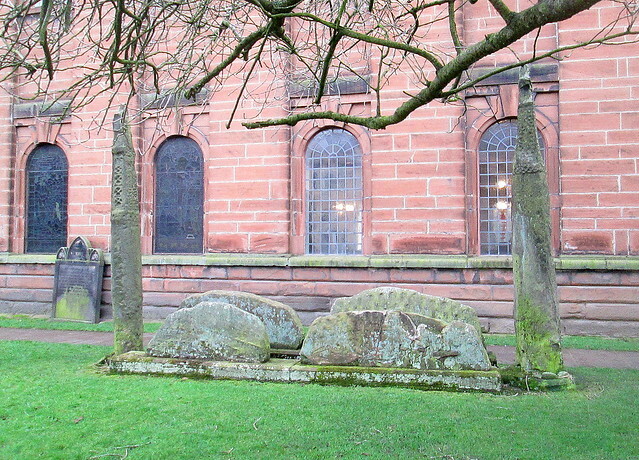 But I was interested in the ‘Giants Grave‘ in the churchyard. It’s supposedly the grave of Owen Caesarius, king of Cumbria between 900 and 937 AD. 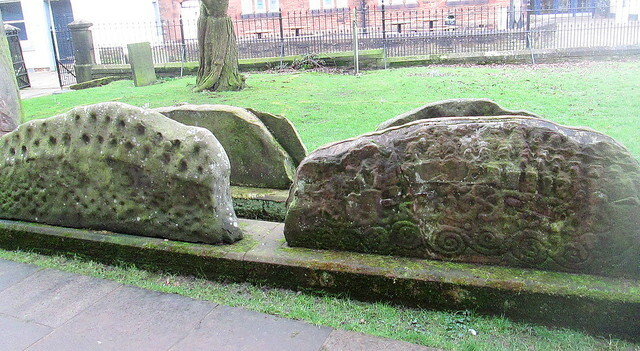 The hogback stones seem to have been used over large parts of Britain, it’s thought they are Viking grave markers. I’m sure there are some in Fife. 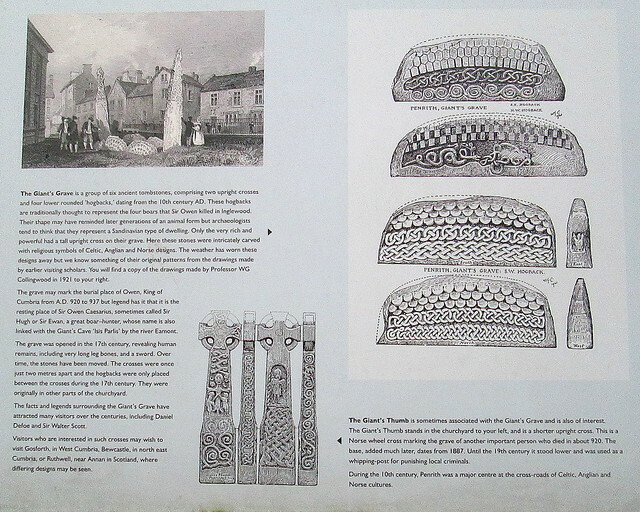 Penrith also has Roman remains nearby, but we didn’t have time to stop off to visit them – another time we will I hope. On the way out of the churchyard I was amazed to see this old gravestone which is situated very close to the entrance. 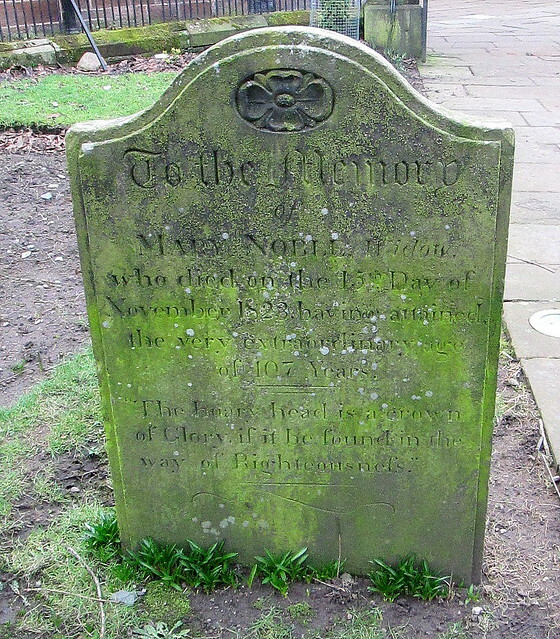 Mary Noble apparently reached the ripe old age of 107 and died way back in 1828 (I think). It’s amazing to think she was born in 1721, she must have seen quite a few changes over the years.